The only thing better than being interviewed about being high while actually high? 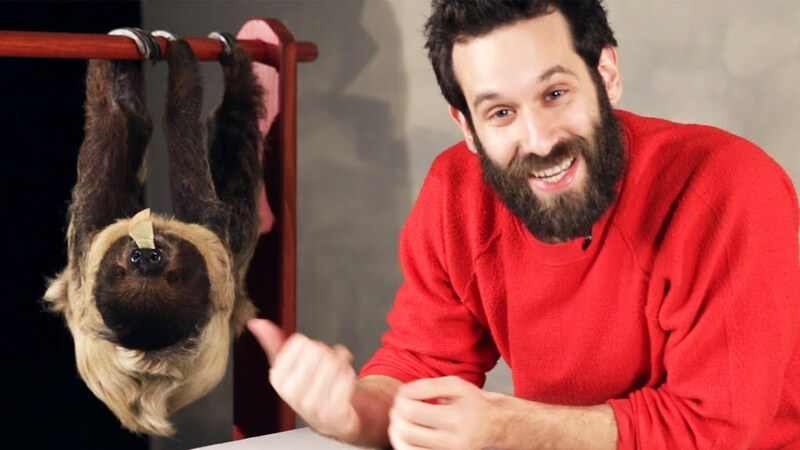 Meeting a cute and chill sloth! Watch these stoned people make a new best friend. These people feeling pretty good, being invited to an interview about their spirit animal while stoned. Little did they know that the interviewers had a surprise in store for them, in the form of a cute and chill sloth that comes out to play. The Hugh Guys, presented by BuzzFeed likes to ask questions of a group of people while they are high to get some funny and insightful answers. In this episode, they start off by asking how high they are, as sort of a baseline. Perfect, nice and toasty. The stage is set. What animal do you feel like right now? Asked what their spirit animal was when high, one guy said a unicorn, another said a whale, but the girl actually said a little sleepy sloth which was more than perfect, because at that moment, here it comes! One guy was so shocked, he literally shouted, then immediately apologized. Another girl could barely contain tears of joy. Even the one guy who seemed to not realize it was there at first warmed up to the little creature. Everyone was in awe of the serene animal as he munched away on a snack and ‘hung out’ with them. How about you? Do you love being around animals when you are high? Have you ever seen a sloth in real life? Share your tales of animal encounters while high on social media or in the comments below.